A Happy New Year to everyone and welcome to the first Run Report of 2019. After last week’s bumper-filled stats edition, a somewhat slimmer Run Report this weekend! But any statistician cannot ignore when a record is set, so let’s start off with that: On Saturday, with a chill in the air, but no signs of any rain or snow, a record attendance of 415 parkrunners completed Market Harborough parkrun. Starting with event number 1 (111). After dropping to the lowest ever attendance for event 2 (92), we then had 5 record attendances in a row, growing from 118 to 179. A month later, saw the 200 mark exceeded for the first time (203 in July 2015) and then a break until January 2016 (209). 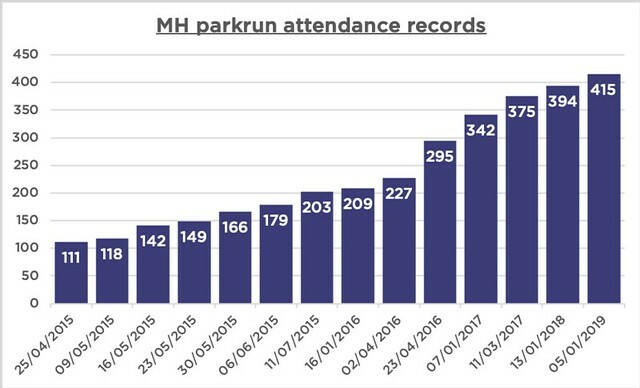 April 2016 saw the record broken twice, once at the start of the month (227) and then on the 4thSaturday of April, MH parkrun’s first birthday (a massive 295). The first weekend of 2017 was the next record (342), nudged up in March to 375. Then came the above mentioned 394 in January 2018, which stayed on until this past weekend. So the big question is: Will 415 be our attendance record for the rest of 2019 and if not, how many weeks until this is broken again?! Records apart, we welcomed 39 First Timers to MH parkrun this weekend, 23 of whom were completely new to parkrun. And we congratulated 48 parkrunners achieving PBs to start 2019 in fine style. Up front, it was a close battle between Steve TURVEY and David STAFF all the way around. Steve kept trying to drop David, but David determinedly stuck on and then kicked on past Steve in the last km, picking up his 4th ever First Finisher at MH, this one by some 10 seconds. First junior through the finish was Ben WOODING, 7thoverall in a cracking 19:34. First Female Finisher was Erin BILLINGTON, setting a PB at 21:04. Congratulations again to Anne DAWKINS for her 50 parkrun milestone – please be patient with the T-shirt order Anne! Otherwise congratulations to Julie LAKE who became our record breaker yesterday in position 395 and our Tail Walkers in positions 414 and 415 – along with all the team of 37 volunteers. We couldn’t do it without you, so thank you once again. Enjoy the rest of your weekend and week ahead and here’s an idea: Why don’t we all do it all over again next week?! This entry was posted in Run Reports and tagged Report, Roger by marketharboroughoffice. Bookmark the permalink. Run Report #207 – 13th April 2019 by Stuart Beard – the man with the blue hair!